Before the Battle, Bruce spent two months training his army. He wanted to make sure his forces were mobile, since immobility had proved the undoing of the Scottish army under Wallace at Falkirk. He organised his horsemen into a light cavalry of about 500 (who faced the 2000 heavily armoured English cavalry). There were 4 Scottish Divisions of foot soldiers, and a few archers from Ettrick Forest. It is claimed that the Camerons, Campbells, Carmichaels, Chisholms, Frasers, Gordons, Grants, Gunns, Mackays, Mackintoshes, Macphersons, Macquarries, Macleans, MacDonalds, MacFarlanes, MacGregors, MacKenzies, Menzies, Munros, Robertsons, Rosses, Sinclairs, and Sutherlands were there. They were determined as patriots to defend the Independence of Scotland under Bruce's great leadership. The fact that the Scottish nobles, knights, landowners and tenant farmers fought on foot together with their men made for a more cohesive force than the English army which was less democratic. Most of the English leaders were in the cavalry, leaving the infantry at a disadvantage. Bruce prepared the battle field by digging rows of camoflaged pits and laying calthrops to maim the cavalry horses. and the English, headed by their King Edward II (Longshanks son). The English were soundly defeated and Edward barely escaped capture. The film Braveheart gave the impression that the Scots only decided to fight instead of agreeing to humiliating English terms, at the last moment. This is not the case. On the contrary, Bruce won because he and his army of 5000 men, were better prepared for this battle than were the much larger English forces of 20,000. Bruce was one of the fighter kings of Scotland. Not all of them were called to arms, but many were and acquitted themselves bravely in battle, including Mary, Queen of Scots. At one point during the evening before the battle of Bannockburn Bruce was riding on a pony with only a battle-axe as a weapon. 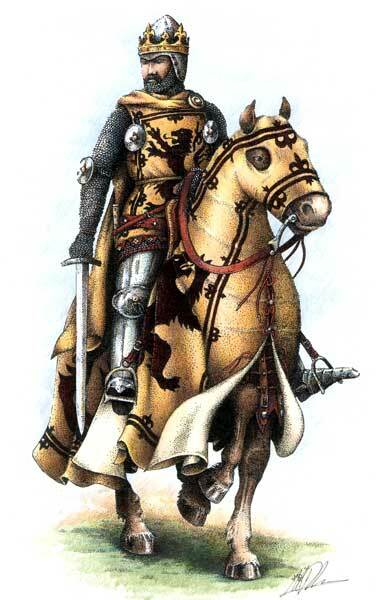 An English knight, Sir Henry de Bohun, recognised the king by the gold coronet on his helmet and rode full speed at Bruce on his huge war-horse. 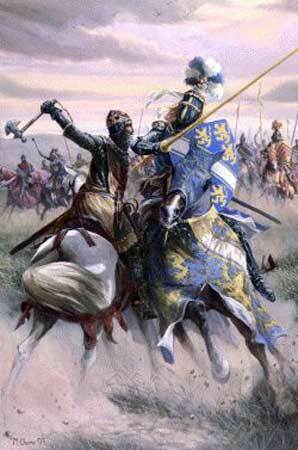 Just as he closed in, Bruce turned his nimble pony aside and avoided the thrust of de Bohun's lance. Instantly, Bruce stood up full-height in his saddle and with one blow of his axe on de Bohun's helmet, felled him to the ground. The Scottish lords blamed Bruce for taking too much of a risk, but he only replied "I have broken my good battle-axe." The next morning the two armies prepared for battle. The Scots went down on their knees to pray, and King Edward seeing this said "See, they are kneeling to ask for pardon." His companion replied that "they are asking pardon from God, not from us." The battle commenced, and raged for many hours, its fate undecided until a lucky incident. Coming over the crest a hill nearby, the English saw what looked like another Scottish army. It was only the gillies (servants) of the Scottish army, and some local people who came to help, with banners flying, but it was enough to dispirit the English and encourage the Scots. 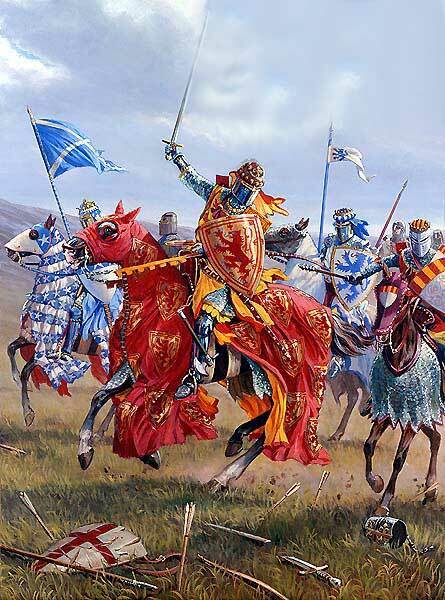 The battle was soon over, with the English King Edward fleeing all the way to Dunbar pursued by Lord Douglas. Bruce lived only one year after the treaty of Northampton that brought peace between Scotland and England in 1328. His body was buried at the Abbey Church of Dunfermline, under a marble monument brought from Paris. In the centuries that followed the church fell into disrepair, the roof fell in and the monument broken under piles of stones. But in 1821 workmen uncovered pieces of the monument, and on digging underneath found the skeleton of Bruce. They say that people came from all over Scotland to gaze on the remains of their most famous king. Before he died, Bruce asked that Sir James Douglas should carry his heart to the Crusades. So after Bruce died, his heart was removed and placed in a silver casket. Douglas went to fight the Saracens in Spain, and in battle he and his men were surrounded. Flinging the silver casket far ahead he is supposed to have cried out "Pass first in fight, as you were wont to do; Douglas will follow or die" He rushed the enemy, and was killed by many wounds. After the battle his body was recovered lying on top of the silver casket. The casket and Douglas's body were brought home and buried - Bruce's heart at Melrose Abbey, and Douglas at his father's castle. In the year 1314, after 18 years of war, Scotland north of the Forth was free. Stirling, one of the few castles still held by the English lay under Scottish siege. Edward Bruce, the King's brother, lacking in siege equipment, had remained their for many months in the hope of starving the English out. Sometime in the spring though, Edward, in the chivalry of the time, made a pact with the castle's governor, one Sir Philip Mowbray. It was agreed that if an English relieving force had not arrived by midsummer's eve, the castle would be surrendered to the Scots. Robert, on hearing of this was furious with his brother. So far he had relied entirely on guerrilla tactics to oust the English, and undoubtedly Edward II would send a force north, which would mean a pitched battle if Stirling was to be saved. oblige, deciding he could finish his father's work in one huge thrust. He amassed an army of some 40,000 men with the intention of crushing the rebellious Scots once and for all, so finally putting and end to the dispute. A schiltrom was basically a large circle of men who carried huge 15 ft pikes. They were trained to march consistently in this formation with pikes outwards, forming an impenetrable wall of spears. decisions. From past experience, he knew that because of the small size of his army, to beat the English he needed to fight them at his chosen location, preferably a place where they were confined to a small front. Robert had originally intended this to be between the forest of Gillies Hill and the Bannock Burn gorge. Now that Edward's army had camped upon the carse, the battle would inevitably have to take place on the flat field that stretched down from the road towards it. 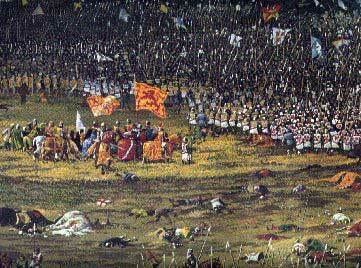 This meant that the battle front was to be much larger than Robert would have liked. The only benefit to this site was the small gorge that lay between the carse and the field. Although it was not particularly deep, it's sides were steep and it would be a slow process for the large English army to cross safely. 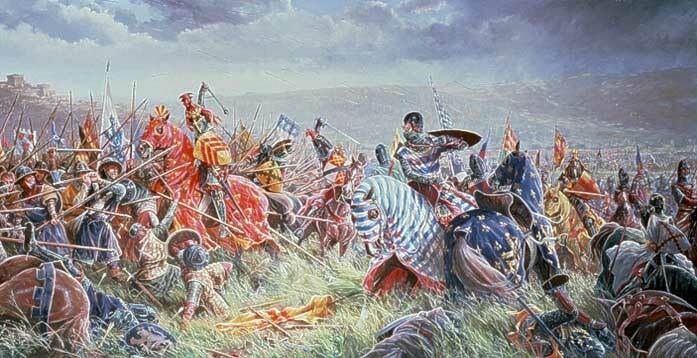 Robert knew that if he could attack the English as they were still crossing, he might be able to drive them back upon their own men still trying to cross the gorge. This would cause confusion and disorganisation among them, exactly what he needed. becoming horribly apparent to them. Most of their archers were now across the gorge and in a panic someone had given the order to fire. Unfortunately for them, not only were they hitting the Scots but much of their own retreating cavalry. The archers were bad news for the Scots, who no longer had the cover of the trees, but Robert had planned for this. As soon as he gave the signal, Keith the Marischal of Scotland, commanding some 500 mounted infantry charged out of the woods and routed the archers from the field.